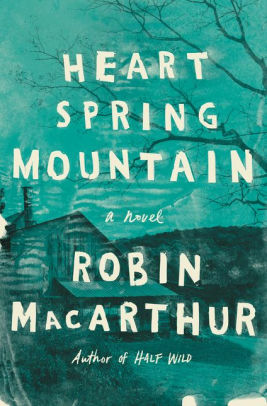 Robin MacArthur's slim, elegant short story collection published in 2016 — Half Wild — surprised me in how much I liked it. 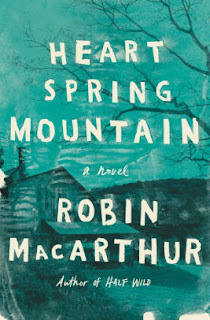 And she pulled off a similar trick with her debut novel, Heart Spring Mountain. The story of three generations of women isn't something I'd normally leap at. But I liked MacArthur's style enough in her short stories (and her environmentalism — check out this interview in the Chicago Review of Books) enough to give her debut novel a try. Like the stories in Half Wild, the setting for this story is rural Vermont — specifically a hillside where this family has lived for 200 years. Vale is a mid-20s woman who actually doesn't live in her childhood rural Vermont anymore. Instead, she has been living in New Orleans, bartending and stripping to make ends meet. And she's lost her sense of her roots, though she may not quite realize it. She had left Vermont after high school, and hasn't been back in the eight years since after a falling out with her drug-addicted mother, Bonnie. As the novel begins, Bonnie disappears during Tropical Storm Irene. It's late August, 2011, and Vale returns to Vermont, reluctantly, to try to find her. While there, and living in a ratty old camper on the family's property, Vale begins to research her family history, piquing her curiosity more and more as she discovers more, and furthering her sense of who she is now and where she came from. MacArthur writes in short chapters from the perspective of different characters at different times. Vale's grandmother Lena is a fascinating character — an eccentric, living by herself in a small cabin on the mountain, and owning a pet owl, as well as one big secret that will wind up having a profound affect on Vale. Deb is Vale's aunt who lived on hippie commune for a while in the 1970s, married Vale's uncle Stephen, and now takes care of Vale's grant aunt and Lena's sister Hazel, whose health is failing. Hazel still lives in the house that was built more than 200 years ago. The relation between all the characters is a little confusing for a bit, but once you understand who everyone is and how they're related (I drew myself a little family tree), the story unfolds much more easily. And again, as with MacArthur's short stories, the strength here is her description of place and her evocative, poetic writing. But her style can also be powerful, especially in Vale's case. She carries a depth of emotion that seethes beneath the surface. Something about MacArthur's writing, I just connect with; it's soothing, like the best stress reliever. So even though the pace is a bit deliberate, and not a tremendous amount actually happens, it's a novel I can't stop thinking about and can't recommend more highly if you're like me and love novels in which place is as much a character as the characters themselves. The Overstory: What Is Our Place In This World?